How I got this book: got it with a giftcard which I'd gotten for my birthday last year :) People give me books for my birthday! Yay! Goodreads summary: "Of all the great love stories ever told, hers is perhaps the most famous. To me, she is the key to my family's fate. To you, she is Juliet. When Julie Jacobs leaves for Italy per the instructions of her late aunt's will, she never imagines that she'll be thrust into a centuries-old feud, not to mention one of the most legendary romances of all time. 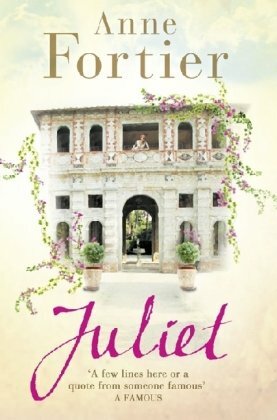 However, as she uncovers the story of her ancestor, Giulietta, whose love for a man named Romeo proved ill-fated, Julie finds herself increasingly under threat, and can't help but feel that the past and present are very much connected." I've never heard of this one before. Sounds like a good one. Thanks for the awesome review. I really loved this book as well, a great take on the Romeo and Juliet tale! Sounds fun! Guess I need to add it to my neverending wishlist. This has been in my TBR pile...looks like I will try to bump it up towards the top... great review! Oh, I've been dying to read this! Have you read Juliet Immortal by Stacey Jay? It's so good! I love this book sooooo much! For me it was something really special because I know Siena pretty well and I just saw the city before me while reading. Was so amazed by this novel that I gave it to two or three friends as a birthday present. Daisy, I can highly recommend Italy in all its beauty. When you do come visit one day don't miss Florence. It is such a beautiful city and full of history (Medici, Michelangelo, etc.). I can highly recommend Tuscany and its cities. Worth a visit! Hope you amke it one day! Sounds like a fun twist on Romeo & Juliet! I've heard about this from others and they all seemed to enjoy it a lot. It's definitely being added to my TBR pile! You should....you really should....spent many childhood summers in Tuscany and fell in love with it...magical place...do you know Daughter of Siena by Marina Fiorato? Is about the Palio and Siena in the times of the Medici. Also a good book. Funny - I was just eyeing up this book at the airport bookstore yesterday. Glad that you enjoyed it! I definitely liked this one, but I wouldn't say I loved it. I think my problem was that I was so involved in both stories - past and present - that whichever I was reading I wanted to know what was going to happen next in the other! Perhaps that's just a testament to how well Fortier captured my interest in both narratives. I have read this book i fell in love with the adventure and the love. This book is defiantly a keeper.